I'll throw a handful of nickles into your driveway as I speed past. Couple years ago my Mom(87) gave me a gift, well preserved. A little plastic drum kit, that was a topper on a Birthday cake from my very young youth. I cherish it, and display it. At the same time, A Santa hot chocolate mug, that I'm using as I type. No stress, no gifts except for the very young. We stopped giving gifts years ago and made it about family. That also changed for us personally when we started to go south. Our family still gets together, we have attended a couple of times. We do enjoy the many friends we have in the south. One of the best parts is being a base for any family who wants a winter getaway. They can stay with us, in a hotel or whatever, We can show them around or lend them a vehicle and have a great time. This season should not be about stress but about enjoyment and relaxation. If you are stressed I believe you are doing something wrong. We used to have 12 to 15 and my wife's family used to have 20 plus. No stress, everyone helped and if something went south, so what, just keep trucking. Life is away to short to be stressed about every little thing. MERRY CHRISTMAS AND A HAPPY NEW YEAR TO ALL!!!!!!!!!!!!!!!!!!!!!!!!!!!!!!!!!!!!!!!!!! Also by "slay Christmas" I mean to end the sentimentality that it is good for everyone. No it isn't. Here's a meme featuring the airline industry, only I don't even mean the air crews whom make it all happen, I mean those getting away from home, to not be here for Christmas. Also, there's this thing I hate the most, those people who act aghast that I work on Christmas. Like I'm personally breaking some sacred pact that no one should work on Christmas. Nurses, doctors, airline industry people, corner store workers, gas station workers, community health workers, care aides in every facility, schedulers, supervisors, RCMP, paramedics, every hospital staff in KGH on Christmas day to make it all happen, Vets when Fluffy eats tinsel, and on and on. Slay the "you work CHRISTMAS DAY? Attitude. And a pause for those for whom Christmas can never be the same without that one person in their lives. I know so many by now, when we're younger, perhaps we are not so aware, but oh boy, at my age, I am more than aware. 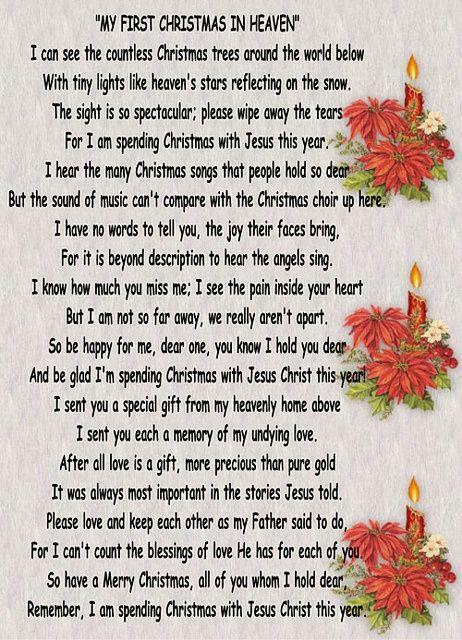 Here is the most beautiful poem I can imagine for those without that special loved one at Christmas, and years do not dull the pain. For every photo you're going to see on facebook of happy families celebrating, there a million photos in the heart. My best girl survived a seven minute cardiac arrest on December sixth. My very best Christmas present ever, a Christmas miracle. Off to Victoria tomorrow for a pacemaker/defibrillator implant. I'll never ask for anything ever again. Merry Christmas to all. Merry Christmas Snman! And you and she have been blessed above all. Queen K wrote: And a pause for those for whom Christmas can never be the same without that one person in their lives. For Gods sake stop cutting those onions! I know right? Onions everywhere! I hope many here still look forward to NORAD's tracking Santa over the North Pole with their kids? Remember, this Christmas "deck the halls and not your family." Should be easier said than done when there is always that ONE family member who is malignant and narcissistic. The one who button pushes on what should be a fun gathering. On purpose. The one who can't let what happened in 1985 go. And keeps bringing it up, for years. The one who criticizes for no reason whatsoever, what happens to be in sight. The one who is less successful than you and makes digs. The one who is more successful than you and makes digs. Did you know there are entire communities on facebook in regards to narcissism? They assist each other with understanding the condition, the abuses, the post traumatic stress syndrome you've experienced and the very real medical health conditions as a result of neglect, abuse, physical, mental and emotional, and most of all: gaslighting. The most talked about technique narcs use. For many these groups assist in what is called "NO CONTACT", members provide support to those who are trying to get away from trauma bonding. No contact is encouraged and repeatedly. Christmas leaves relationships, past and present, open to more abuse and more experienced people know this. They are helping the most. NO contact means: moving miles away, no calls, no texting, changing numbers, addresses, email accounts and most of all, blocking. Christmas is the most difficult time because people who had to get away from families want what is normal for the most of their friends. But they can't have it. They never had it. They never will. The black hole in their soul can't be filled. Narcissim, overt, covert, especially is real. It's dangerous and it's in a lot of families. Christmas has to be reinvented for those and by those who just can't be near families. Forgot to add: people who are subjected to endless abuse and STAY are called "supply." Read that a few times to get it. i remember one Christmas Eve, a neighbour saw us pulling into our driveway. He came running up to us, "You won't believe this" but a thing is being tracked over North America!" We said, "a thing?" Agog. "Yes, and no one knows what it is." Christmas Eve. Over the North Pole. He had partially heard a radio report over something being tracked by NORAD. Make no mistake. Being somewhere special at Christmas is a beautiful thing. Big White, Sun Peaks, Silver Star, and the like. What I am saying also though, is that a lot of families also stay home and also make for beautiful holiday experiences. You're not nothing if you aren't in some exotic place. I've done both. Another crazy memory, gawd. Being up at Big White, a Christmas overnight with a group from a company paying the shot. We did XC on the trails, almost killed myself falling and speeding into a giant ice bank. But what I recall the most was how beautiful it was up there at Christmas. I'm not a downhill fan, so there's no reason to be up there for me. But those who are forever pumped the Okanagan lifestyle of ski/boat/resorts/wine and golf, Christmas can feel like you are left out. Nothing. Pass on the onions, it's all marketing. Please remember that.